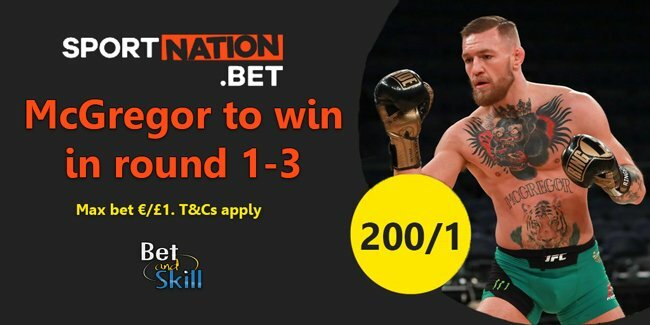 Get 200/1 McGregor to win in Round 1-3 at Sport Nation! Best price! 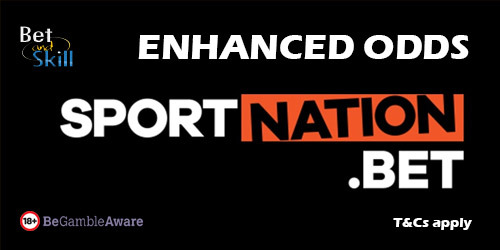 Sport Nation is the latest addition to our trusted betting partners and you can claim a terrific 200/1 on Conor McGregor to beat Mayweather in round 1-3 when you join them via this page! This is the highest price boost you can find on the Internet! Bookmakers revelaed that 86% of the best have been placed on Conor McGregor to win! If the Irishman has a chance, it will come at early stages of the fight. Place a £1 bet on McGregor to beat Mayweather inside the first three round and get paid at 200/1! Find here how to claim your price boost! Simply register and deposit through the promotional page. Then proceed to place your bet on 'Conor McGregor to win in Round 1-3' in the 'Round Betting' market at standard odds. This offer expires on 27 August 2017, 4AM. Don't waste your time! 1.This offer is valid for new customers only. Only one offer per customer. 2. Bet on McGregor to win in Rounds 1-3 at the normal market price. Max qualifying stake of £1. More than £1 can be staked, but only £1 will qualify for the enhanced offer. 3. If the bet wins you will be credited the normal price in cash and the extra winnings will be credited as bonus funds within 24 hours of the bet settlement. Refunds will be in the form of bonus funds. Bonus funds have a staking requirement of 7x their value at odds of 2.0 (EVENS) or greater before the bonus funds and any winnings can be withdrawn - i.e before your bonus funds and subsequent winnings can be withdrawn, customers must place a bet (or series of bets) on any market with minimum odds of 2.0 with a minimum stake (or aggregate stake) equal to 7x the value of your bonus funds received. Once such bet(s) have been settled, any bonus funds and winnings attributable to this promotion will be withdrawable. System bets will not count towards the wagering requirement. 4. Customers will have 30 days to meet the turnover requirements after which time the bonus funds and anysubsequent winnings shall be forfeited. 5. Qualifying bets must be placed from real money balance. Free bets will not qualify for this offer. 6. In-play bets will not count towards this offer. 7. Cashed-out bets will not qualify for this offer. 8. Bets must be placed as a single bet, any bet part of a multiple will be settled at the normal market price. 9. General SportNation terms apply. 10. Customers redeeming this offer are not eligible for any other new customer offer, including, but not limited to the first deposit match offer. 11. This offer expires on 27 August 2017, 4AM. Notwithstanding this, we reserve the right to cancel or withdraw this offer or change any of its terms at any time and without cause or notice. "Get 200/1 McGregor to win in Round 1-3 at Sport Nation! Best price!"